In medium mixing bowl whisk together flour, powdered sugar, baking powder, and soda. Soften butter and cream cheese in microwave. Don’t get it too hot, it will kill the baking powder. Beat eggs, and add to flour mixture, along with vanilla. Then add cheese and butter folding in all ingredients. Pour dough into food processor or mixer and blend until dough is smooth. Don’t over mix, it will make the cookies tough. Place dough back in mixing bowl, cover and refrigerate until dough is cold. When dough is really cold, pour onto wax paper that has been covered in powdered sugar. Make sure dough is covered on both sides with powdered sugar so that it doesn’t stick to rolling pen. Roll out dough a little thicker than ¼ inch. Using cookie cutters cut out cookies and place on lightly greased cookie sheet. Bake for 12- 14 minutes or until cookies start to brown. Let cool before removing from cookie sheet. 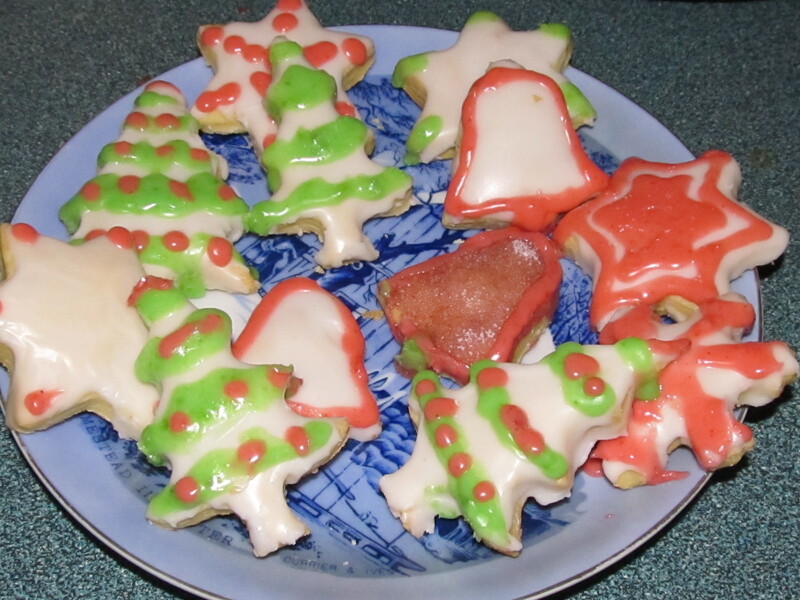 You may brush with melted butter and dust with powdered sugar, or ice cookies and decorate.